20x24x4 Four Seasons Annual Pleated AC / Furnace Filter (MERV 11) | Air Filters, Inc. 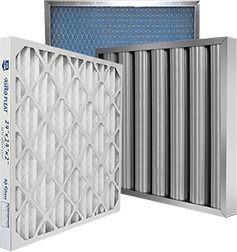 Simply remove your existing filter and replace it with the Four Seasons™ MERV 11 Annual (Up to 12 Months) Expanded Metal Backing pleated Air Filter no tools or modifications is necessary. MERV 11 rated air filters meet and/or exceed standard requirements for American Lung Association® Health House® and utilizes electrostatically charged, 100% synthetic media which offers significantly higher particulate efficiency than regular poly/cotton media pleated filters, with little change in static pressure. MERV 11 filter media will not promote the growth of bacteria, mold, mildew, or fungi in normal operating environments, and has not been chemically treated. Four Seasons™ MERV 11 pleated filters are an ideal upgrade from standard disposable panel filters. These filters are designed to last up to 12 Months. * MERV 11 annual pleated air filters media is thermally glued to expanded metal backing to prevent the media from sagging during the filter's use. * MERV 11 annual pleated air filters pleats are formed in a radial configuration to insure proper dust loading. 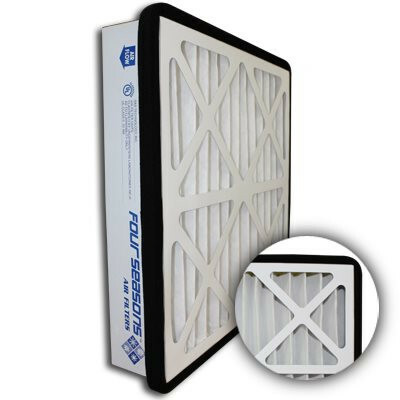 * MERV 11 annual pleated air filters cartridge is encapsulated in a heavy duty die cut beverage board frame to insure filter integrity in high moisture applications. * MERV 11 annual pleated air filters face of the die cut is internally glued to the apexes of the pleats to insure maximum endurance under adverse conditions. * MERV 11 annual pleated air filters media is electrostatically charged. * MERV 11 annual pleated air filters contain 9 pleats per linear foot which creates a greater surface area to catch airborne particles.